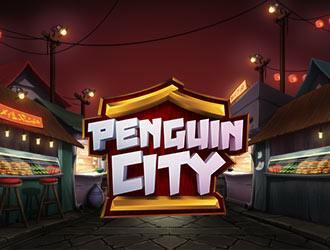 Penguin City is a slot game developed by Yggrdasil. It is a wacky-themed slot game that is played on 5 reels, 3 rows and allows you to make winning combinations in 243 ways. This slot is set in a Chinese Restaurant. In Penguin City, Penguin workers are obligated to do the muddy work of the kitchen. So, as they are treated badly by the Chef, the Penguins are making a plan of their runoff. In The Penguin City slot, you can set the minimum bet at 10p and the maximum goes up to £125 per spin. The lower valued symbols which are included in this slot are shown by clumsy suits of cards which are of different colours. The higher valued symbols are represented by many items which are related to food such as The Chopping Knives, Noodle Soup, Cooking Pots, Soya Sauce, and Boxes Of Noodles. The regular wild icon emerges only at the reels 4 and 2. This wild substitutes for all the other symbols barring the scatter symbols. Now, the wild which is used to be a part of your win earlier, now it becomes Sticky Wild for the coming spin. To activate the Penguin Escape Mode, you have to get a win on any wild during the Base Game. By your one spin, one Penguin will jump and then she will try to run off. You will get a win only when the Penguins become able to escape. Now, we will discuss The Stacked Emperor Wild, another amazing feature which is offered by this slot. In The Penguin Escape Mode, this wild emerges at the third reel. Once, this wild gets activated, then you will surely have a win. The Chinese Takeout is the highest paying symbol. This icon pays up to 250 coins for the combination of 5 of them. Then, Soya Sauce is the next highest paying symbol. With the help of maximum conflation of this icon, you can win up to 200 coins. Penguin City slot game has many special features which increase the chances of your winning. You can win a total of about 1647 times of your bet amount on any spin. The return to player percentage is expected as 96.2%.